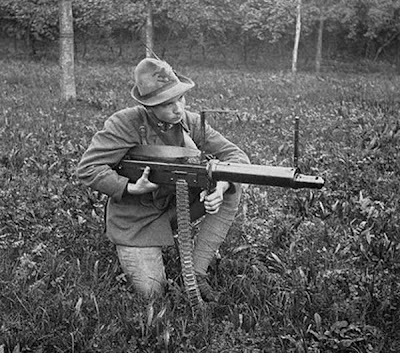 The Skoda M1909 is a Machine gun of Austro-Hungarian (Czech) origin and was manufactured by the Škoda Works in Plzeň. Although it was unable to compete with the more reliable Schwarzlose m/07, it was used in the same period, albeit mostly with reserve and home guard battalions within the Austro-Hungarian armed forces. The M1909 is a delayed-blowback water cooled belt fed medium machine gun, chambered in the 8x56mm round. As with all delayed blowback operated mechanisms chambered for powerful cartridges it suffers from relatively poor performance compared to recoil operated guns such as the Maxim.